Headquarters of the New York Herald in the Field, Army of the Republic. McLean's House. Where the capitulation was signed between Generals Grant and Lee. Dedication of the Monuments on Bull Run Battle-Field. Gardner’s essential project was to recount the history of the Civil War through images. Gardner planned the Sketch Book as a form of documentation, but was capable of stretching the truth for the sake of storytelling. He was also aware of how crucial a role he, his photographer colleagues, and other professionals had played in the telling of history throughout the war. The New York Herald, for instance, assembled its own army of correspondents to follow the movements of the Army of the Potomac. 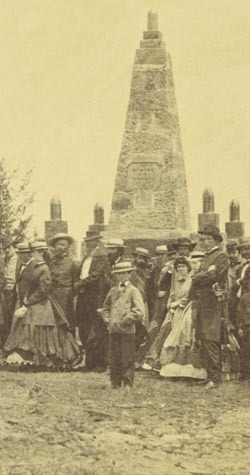 Photographers and journalists worked together to memorialize events and sites of the war, their images and words serving as monuments alongside the obelisk at Bull Run (right). Plate 15. The Moore House. Yorktown, Virginia.